Intero Systems meets the TIA-942 Standards for: Tiered Reliability, Site Space Layout, Cooling, Cabling Infrastructure, Data Center Standards, and Environmental Considerations. Available redundant paths for fiber and copper will always give you a stable and reliable connection, which enables the quickest, most efficient routes to transfer your data with optimal transfer speeds. Intero Systems co-location is a Carrier Neutral facility which provides availability and scalability to our customers needs. The data center utilizes a raised-floor system. The reasons for this configuration are two-fold. First, from a security perspective, all cabling (fiber and copper lines and power conductors) is secured and monitored by data center personnel. Thus, the possibility of a customer pulling the “wrong” cable has been eliminated. Second, cable management is much more efficient when accessible, as opposed to being run overhead. Efficient cable management is essential. All power is run in shielded electrical conduit under floor to prevent signal path interference, which might otherwise impact the quality of the data signal. All connectivity cabling is routed into the customer cabinet/cage areas from below. is routed through strings of gel cell batteries that are capable of maintaining full load for at least 20 minutes in the event of a power failure. Should power be disrupted, the generator logic control systems will sense the interruption and activate the back-up generator to maintain 100% of the load within 9 seconds. Under normal operating conditions, the Power Distribution Units serve as harmonic filters to prevent unwanted electronic signal “noise” from being introduced into customer equipment. By using clean power, customer equipment will run longer and cooler as compared to running off typical unfiltered electrical feeds. The backup electricity also powers our fire suppression and HVAC systems to insure that these systems are not interrupted. All power systems are locally and remotely monitored for additional failure detection and redundancy. provides redundant power in case of an electrical outage. Intero Systems generator ensures 99.9% power redundancy to our data center. The generator is capable of maintaining full load for at least 72 hours before needing to be refueled. provides our data center with a multi-zoned gas fire suppression system instead of a water based sprinkler system to insure that in the event of a discharge, no damage to equipment will occur. The activation process requires detection smoke “sniffers” and heat detectors located throughout the facility to trigger the alert. The data center is also fire-wall protected. provides a fully redundant cooling system and electric coil heating system feeding multiple Leibert air-handling units. Intero Systems utilizes two units for complete air distribution. Air circulation is provided via a down draft raised floor system where conditioned air is provided from below and drawn up and across the facility through unit returns. The HVAC systems supplement facility anti static flooring surfaces by also maintaining proper humidification to prevent static discharge within the facility. Humidification is provided via infrared source to maintain humidity levels. 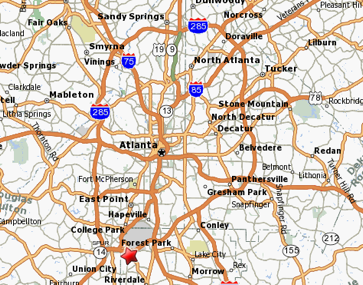 We monitor the HVAC and humidification systems both locally and remotely. Intero Systems provides two secure entrance rooms to access customer equipment, demarcation points and the interface to facility cabling. All entrance rooms are secured by key card access. The security system is monitored both locally and remotely. 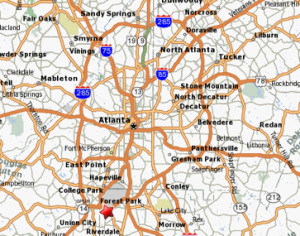 Conveniently located between I-85 and I-75, just minutes south of the Atlanta Airport.